(CNN) Fans’ final vision of Kobe Bryant in a purple and gold uniform was like many before as the Lakers’ legend scored a spectacular 60 points in his farewell NBA game. The third-leading scorer in NBA history, hit in recent years by injuries that made too many of his final contests a struggle, completed his glorious 20-year career with the style that made him a five-time NBA champion. The 37-year-old showed the tenacity, toughness and talent that made him one of the all-time greats in basketball history. And unlike many games this season, Bryant’s heroics helped to bring victory. The Lakers trailed the Utah Jazz for most of the night, but Bryant sparked the Lakers in the fourth quarter, rallying them single-handedly to a 101-96 win. Bryant, who left the game with 4.1 seconds remaining, was swarmed on the court afterward by former teammates and coaches. 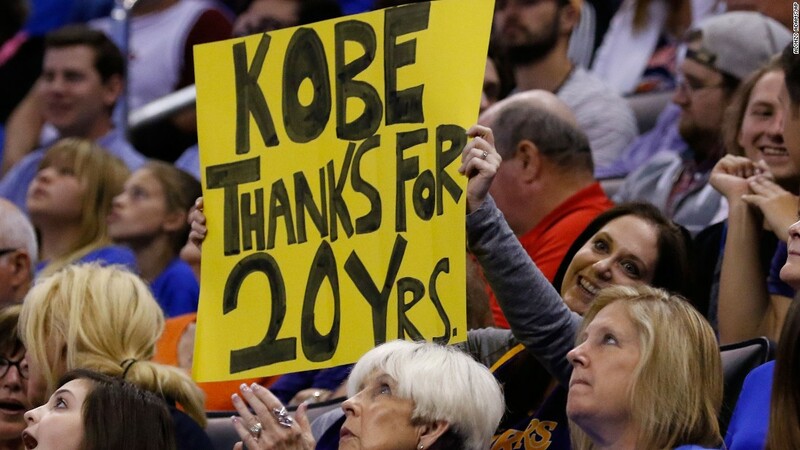 “I can’t believe how fast 20 years went by,” he told the Staples Center crowd after the game. Bryant thanked the Lakers’ fans, his teammates and his family. He recalled how it was his dream to play for the Lakers, his favorite team growing up. “You can’t write something better than this,” he said. 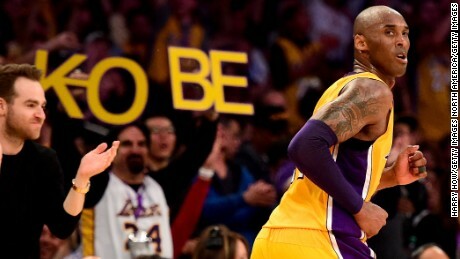 Bryant, who made 22 of 50 shots, laughed in his farewell speech because he’d been told for two decades to pass the ball. Bryant, whom Magic Johnson referred to in a pregame ceremony as the greatest Laker, finished his speech with “Mamba out” — a reference to his nickname, “The Black Mamba”– a kiss, and a literal mic drop. How great was Bryant on Wednesday? 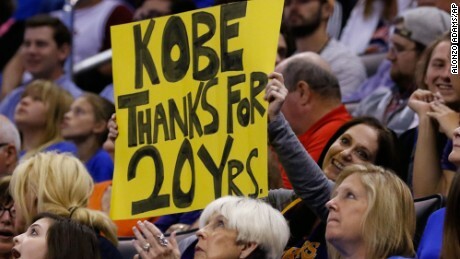 He outscored the Jazz in the fourth quarter 23-21. With his team trailing with just under six minutes to go, Bryant scored 17 consecutive points for his team. Bryant got the ball with his team down 1 point and 40 seconds remaining. It was a scene NBA fans have seen so many times before. Bryant dribbled the ball upcourt, surveyed the defense, headed to his left then reversed course to use a screen. With his man respecting Bryant’s ability to drive, the legend pulled up from just inside the 3-point line with 31 seconds remaining. Related: Warriors and Kobe in ESPN ratings shootout – who won? As soon as the ball left his shooting hand he knew it, the Jazz knew it, 19,000 Lakers fans knew it and the growing TV audience knew it. Quintessential Kobe. He knocked it down. Another game-winner for a highlight reel full of mesmerizing moments. Before the game, most remaining tickets for the game at the Staples Center in Los Angeles were selling for four figures on reseller StubHub, according to a spokesman for the company. One ticket was listed for $27,500, Kevin Burke said in an email. One fan, who with his two buddies paid $4,200 for three $34 tickets, told CNN they came from Oregon to watch the final game. Bryant announced this season would be his last in a poignant letter written in the form of a poem on The Players’ Tribune in November. “This season is all I have left to give,” he wrote in “Dear Basketball.” “My heart can take the pounding. My mind can handle the grind. But my body knows it’s time to say goodbye. The Charlotte Hornets drafted Bryant as the 13th pick of the 1996 NBA draft after he entered the league straight out of high school. He was traded to the Lakers for Vlade Divac. What followed was a career with a list of achievements so exhaustive, it has its own Wikipedia page. Won two Olympic gold medals — in 2008 and 2012. Six 60-point games, second to Wilt Chamberlain. Staying with one team for an entire career is rare. Staying on one team for a 20-year career? That’s extraordinary. According to ESPN’s Arash Markazi, just 11 players across the NBA, NFL, MLB and NHL have done so. Bryant’s career with the Lakers compares to the likes of Derek Jeter with the New York Yankees, the late Tony Gwynn with the San Diego Padres, Cal Ripken Jr. with the Baltimore Orioles and Steve Yzerman with the Detroit Red Wings. Bryant’s career was not without controversy. In July 2003, he was charged in Colorado with one count of sexual assault in a case involving a 19-year-old hotel worker. The charge accuses Bryant of “sexual penetration or intrusion and (that) he caused submission of the victim through actual physical force,” according to Eagle County District Attorney Mark Hurlbert. The charge was dropped in September 2004. The woman involved in the criminal case also sued Bryant. They settled for an undisclosed sum. Bryant also feuded with teammate Shaquille O’Neal to the point where the Lakers traded O’Neal to the Miami Heat in 2004. The two later explained that it was a case of two strong-willed people involved in a long-running workplace dispute. They can now fondly reminisce about the three consecutive titles they won as teammates. The two hugged after Wednesday night’s game. It had been tough during Bryant’s farewell tour. For most of Bryant’s career, the Lakers were winning or contending for NBA championships, hardly ever missing the playoffs. Not anymore. Right now, that stage belongs to another California team, the Golden State Warriors. The Lakers haven’t been to the playoffs since 2013. This season has been nothing short of abysmal. Young and rebuilding, Los Angeles lost 65 games, the most in its 68-year franchise history. And some of the defeats were really bad — the Jazz downed the team by 48 points on March 28, tying for the largest loss in the Lakers’ history. Additionally, Bryant’s numbers dipped. This season was his worst shooting year in terms of field-goal percentage. Injuries slowed him down. For three consecutive years, his season was ended by injury. There was the ruptured Achilles tendon in April 2013. In 2014,he missed all but six games after breaking a bone near his left knee. And then a torn right rotator cuff in January 2015 required surgery. And while he’s played through injuries in the past, the wear and tear has become evident, with an occasional night off needed for rest. But as the end approached, Bryant did his best to play through pain so fans across the country could see him one last time.